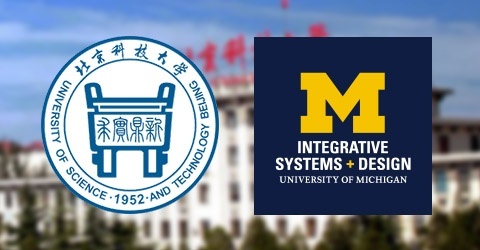 The agreement between the University of Michigan (UM) and the University of Science and Technology Beijing (USTB) is to provide an efficient transition for USTB students desiring to apply to and pursue UM's Master of Engineering in Manufacturing program. Undergraduate degree must be completed in good academic standing (defined as an overall score of 80/100 or higher or 3.0/4 or higher). Applicants should have relevant industry-related working/internship experience by the beginning of the first semester of enrollment. An online application is required. In addition, a statement of purpose, personal statement, a resume, two letters of recommendation (at least one from a USTB professor), and official undergraduate and graduate (if applicable) transcripts are required. Applicants whose native language is not English must demonstrate English proficiency and are required to provide one of the official score reports (ECPE, IELTS, MELAB, or TOEFL). The Graduate Record Examination (GRE) is required. Only credits that are not applied to your undergrad degree are eligible for transferring. Each approved transfer course will be listed as being equivalent to a 400 or 500 UM graduate level course. Courses cannot be transferred if taken more than five years before beginning the present program. Must enroll in at least 24 credit-hours through UM registration. 24 credit-hours of UM registration includes 3 credit-hours of MFG 503 project. 24 credit-hours must be graded (A-E) for UM courses and graded with a score of at least 80/100 or higher for any USTB courses. The 3 credit MFG 503 project is required and will be graded Satisfactory/Unsatisfactory. 24 of the credit-hours must be 500 level or above. If a student plans to count any USTB transfer course/s as 500 level, the course/s must be approved by UM as being equivalent to UM 500 level. At most, 6 credit-hours may be taken in courses at 400-level. A 400-level course must be considered as a graduate level course by the UM home department. If a student plans to count any USTB transfer course/s as 400 level, the course/s must be approved by UM as being considered equivalent to UM 400 level. A minimum overall grade point average of 3.0/4 (B average or above) is required for graduation. Complete all of the courses on the approved Plan of Study within 5 years from the date of first enrollment. Students pursuing full-time typically complete the program in 1.0~1.5 years. The Manufacturing Curriculum and Plan of Study web page provides the detailed curriculum requirements and the list of manufacturing related courses that are offered on the UM campus. This web page also provides a link to the Plan of Study form that students complete upon being admitted to the program. If you have any questions about the program requirements, or questions regarding applying to the program, please contact the Graduate Coordinator, Kathy Bishar at kbishar@umich.edu. Prospective students are encouraged to apply using our online application. The process is very clear and the application is received instantaneously.